Computer optimization is an ever-growing industry, as Windows gets more complex with each release and we spend more time on our PC’s and other electronic devices than ever before. Many users learn the hard way that not every PC optimizer can be trusted. Some of them can be not just useless, but even somewhat dangerous, especially if given full reign over the Windows registry or other sensitive locations on one’s PC. How can you tell if a PC optimizer is safe to download and use? Here at SoftwareTested, we do all the testing to answer this question for you. We’ve had a chance to look at quite a number of computer optimization tools over the past year. Figuring out which tools should be considered the top three has been a challenge, as there are several that we have been happy with in terms of effectiveness. However, here are the Top 3 PC optimizers that we feel confident recommending as the best in their class. BoostSpeed is an all-in-one PC optimization suite of tools that delivers outstanding results every time it’s used. It offers the conventional one-click scan and repair functionality that eliminates junk, tweaks the registry and fixes speed issues; plus over 20 additional tools that cover tasks like file recovery, disk wiping, cleanup of duplicate files and many more. The company behind this software has been in the PC maintenance and optimization business for about 10 years and has earned a reputation of a safe and reliable option for Windows systems from XP to 10. 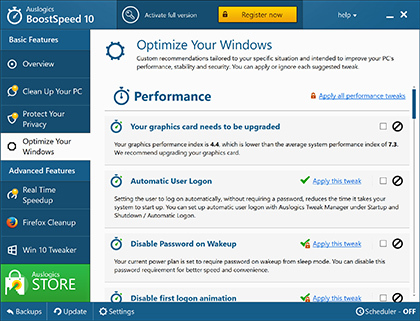 BoostSpeed’s most prominent advantages are the abundance of tools included in the kit, the safety of every tool (including those that deal with the Windows registry) and the actual boost it gives a Windows computer. 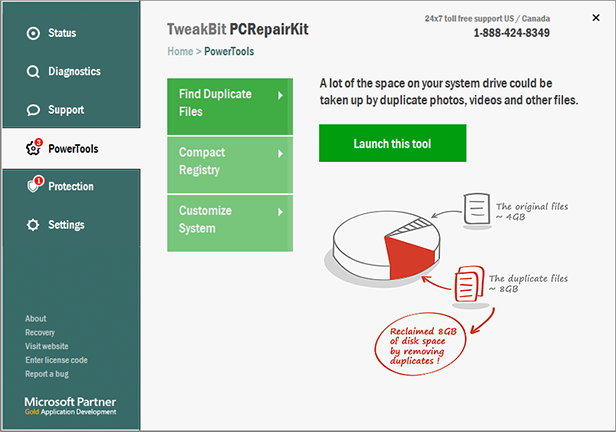 Another powerful application on our Top 3 list is PCRepairKit from TweakBit Software. Just as the name suggests, its specialty is the repair of all sorts of Windows errors and malfunctions, and this app is very good at it. We have tested PCRepairKit against a variety of problems and it passed all our tests. This compact and intuitive app checks your PC for abnormalities that could potentially lead to system errors, application crashes or Blue Screens, then offers an easy way to tweak those problem areas to an optimal state. The tweaks it applies seem to have an effect on most performance areas and result in performance improvement that’s obvious to the naked eye. It fixes stability problems, deletes stuff that could compromise your privacy, offers additional cleanup options through Power Tools and more. What we especially like about PCRepairKit is that in addition to the powerful computer optimization functionality it also includes a security scanner that finds and deletes malware. It’s no secret that malware can cause all sorts of errors and crashes on any computer, so tackling security threats in addition to performance issues makes PCRepairKit a favorite on our list. The PC Repair tool from Outbyte makes it to our Top 3 list as one of the simplest, yet safe and powerful PC optimizers available today. The tweaks it offers are divided into three categories: speed, privacy and battery. Any user who sees the three tabs would be able to tell right away where this program could help their computer. The speed tool offers standard search for issues that might be reducing your PC’s speed and lets you fix those at a click of a button. Then you get to locate and delete traces of your credit card info, SSN’s and other sensitive data under Privacy. Many users today own a laptop computer, and to a large number of people a laptop is their main machine that they use for work, personal activities and entertainment. PC Repair offers tweaks that help save power when you are on the go, which means you don’t have to worry about having to charge your laptop’s battery as often. And this feature in Outbyte’s program seems to work better that the power management tools Windows has to offer, so this software comes in handy in more ways than one would expect from a PC optimizer. When you set out on a search for the perfect optimization tool to use on your computer, consider the above three, as any of them will help make your PC a better performer.